Transferred to the University Archives from the Department of English in 1972 (Accession 1972:30), 1974 and 1976. The records are organized into three series: Senior Honors Theses, Henry Reed Prize Essays, and Project on the Design and Management of Instruction. Each series is arranged chronologically and then alphabetically. The Department of English is one of a handful of departments that can trace its origins back to founding of the University of Pennsylvania in 1749. The teaching of English was an integral part of Benjamin Franklin’s educational program for the Academy of Philadelphia – in direct opposition to the traditional training in classical languages. The 1749 constitution of the Academy provided for the appointment of an English Master who would “be most capable of teaching the English Tongue grammatically, and as a Language, History, Geography, Chronology, Logick and Oratory.” In December of 1750, the trustees of the Academy appointed David James Dove as the first English Master. When the College of Philadelphia was created out of the Academy in 1755, English was incorporated into the introductory level of the curriculum. The professor of English in the College was also to be the head of the English School of the Academy. Rev. Ebenezer Kinnersley became first Professor of the English Tongue and Oratory in July 1755 and held that post until 1773. In spite of Franklin’s strong public advocacy for the role of English in the Academy and College, Provost Rev. William Smith preferred to have the College follow the more traditional classical education model. The teaching of English as a distinct course of study in the Academy suffered as a result and there were many discussions among the trustees on the question of if the English School of the Academy should be closed in favor of the Latin School, which served as the preparatory school for the College. When Kinnersley resigned in 1773, he was replaced by the James Cannon who held the dual title of Professor of English and the Practical Branches of Mathematics. Cannon remained in the post as professor and Master of both the English and Mathematical Schools after the Commonwealth of Pennsylvania passed control of the College of Philadelphia to the University of the State of Pennsylvania in 1779. After Cannon’s death in 1781, the trustees ended the dual professorship and appointed Archibald Gamble as Professor of English and Oratory. The teaching of English from the 1790s into the late nineteenth century at the University of Pennsylvania evolved as the University grew. Shortly after the creation of the present-corporate entity known as the University of Pennsylvania in 1791, the trustees appointed Rev. Dr. William Rogers (the first student to matriculate at Brown University) as Professor of English and Belles Lettres and classed the position as one of the standing faculty in the Department (i.e. College) of Arts. After Rogers’ resignation in 1811, the English professorship went into a state of flux as to where it fit within the University’s structure. For a period in the early 1820s it fell under its own division of the University – Department of General Literature – and later was an added as merely an additional responsibility of the Assistant Professor of Moral Philosophy in the Department of Arts. It was not until 1835 with the appointment of Henry Reed as Professor of Rhetoric and English Language that its position as a professorship became more fixed. The English Department in its current form came out of the major restructuring of the humanities curriculum at the University of Pennsylvania in the 1880s and 1890s. The creation in 1882 of the Department of Philosophy (after 1906, Graduate School of the College of Arts in Sciences) and the course in graduate studies it offered had a profound influence on the organization of the College of Arts and Sciences. In 1888, the Department of Philosophy started offering English Literature as a principle or major subject in which a PhD or master’s degree could be earned. The specialization in knowledge and training that the graduate school required also led the College to develop a curriculum for undergraduates that allowed for more focused study in different disciplines. In 1893, the University’s Board of Trustees approved a set course system for undergraduates with different options for concentrations of study. One of the requirements for all students was a set number of classes taught by the English professor and his assistants. The changes necessitated the formation in the college of standing committees of faculty groups. By 1894, English became a distinct faculty group and eventually became known as a “department” by the early twentieth century. This structure has continued to the present. The Department of English Records document student essays written in the mid twentieth century. The majority of the collection contains senior honors theses from 1948 to 1968 which cover a variety of topics relating to both American and British literature. 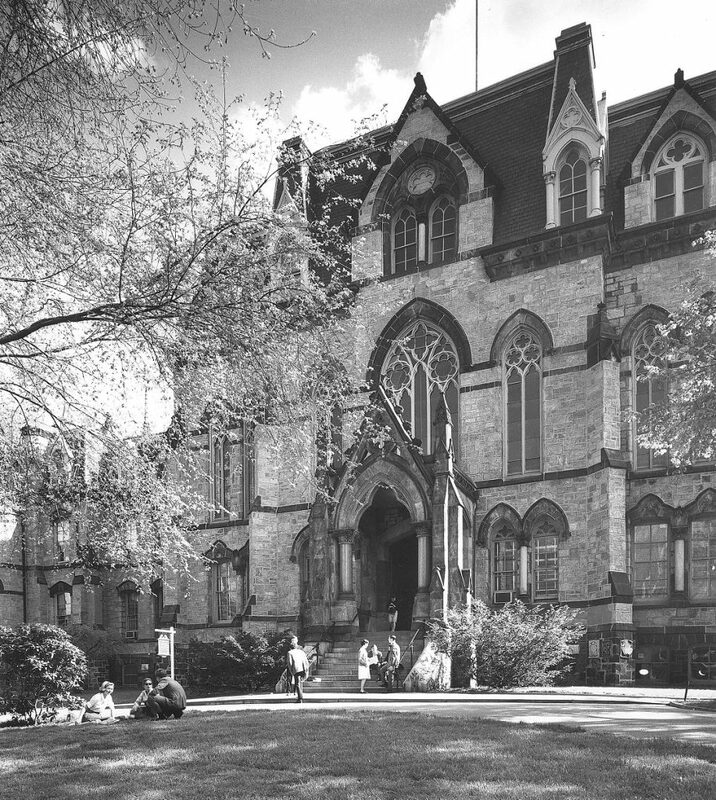 The theses became a requirement for all undergraduate students in English when the University of Pennsylvania established the major subject concentration system for undergraduates in 1948. The collection also contains student essays from the 1970s.